It was another late start in the day, with my daughters first swimming lesson in the morning and the river charts showing them slowly subsiding after a steep rise in river level i was apprehensive of what condition the river might be in. Though as it came to half 11 i decided to go have a go. The weather had warmed up nicely so i knew there should be a 12 o clock hatch and after the ardious walk to the river i found myself in the thick of a of blue winged olives, paraleptophlebia adoptiva, and black hawthorn flies, bibio marci. The hatch was probably the strongest i have seen on the river since i started fly fishing, you could see them bouncing on the surface, taking flight, crawling on the inside of my cap and the inside of my polaroids. I'm quite insensitive to them being on my skin, though the odd one did go in my eye and i'm sure i ate a few. But there was one thing missing, rises. The river was up yes, but it still had good clarity and had plenty of areas for rises to happen. Nothing. The first hour was tough, with the higher river level the water slapping sound made me think fish were rising that i couldnt see in the current so i was constantly chopping and changing my set up, from duo to dry fly. Nothing. Extra weight, nothing. So i moved downstream after an hour or so and found a secluded pool, first cast, fish, it wasn't big but it would turn out to be the biggest of the day. The fish gradually grew smaller and smaller. They were a pleasure to catch, infact it was the type of fishing me and Graeme had been chasing last week. I did bounce of something bigger and did have the line indicator shoot off twice but as i was using my dry fly reel the long range casting with the nymphs meant it had let go by the time the strike had fed through the line. The little trout caused issues with their frantic flapping, causing a rerig on each one but it reassured me that the trout were managing to spawn successfully at least. It did however also make me think were the bigger ones were and why were they still not feeding on dries. 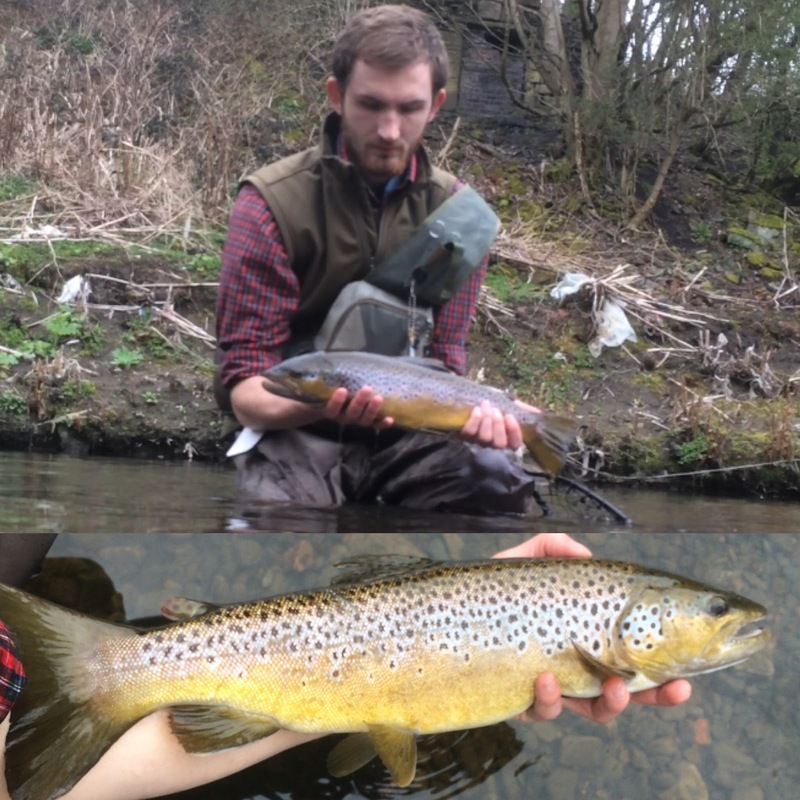 I have had plenty of good fish on dries in March/April over the years but not one yet with barely a rise anywhere. The small trout were all in the right places though, in calm pockets behind big rocks in the main flow, or just alongside the main current in the channels. The size of the fish, especially the last one kind of showed me the big fish were not there, as i have caught fish on streamers bigger than that. 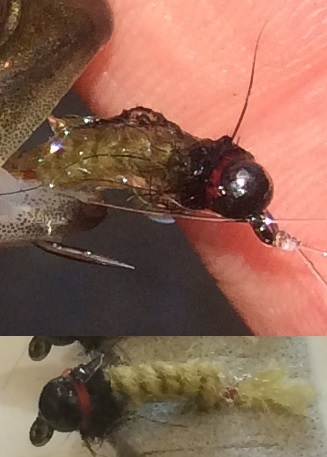 Below is my trusted Bendles bug and a few of the fish i had today, below them (the biggers ones) are fish i have on dries earlier or around this time over the past couple of seasons.